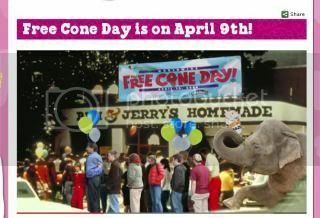 I've got to start with the most important thing happening this week: Ben & Jerry's Free Cone Day - April 9. Of course, you have to drive to the bay area or Napa to participate - but in case you're heading that way anyways - I thought I'd share. It's really sad that both the Ben & Jerry's in Davis and Roseville have closed and that Napa is the closest now. If you're interested in learn a bit more about wine (and who isnt?) you should check out the Kaleidoscope wine classes at Sierra College.The first for this Spring is The Wines of the Mediterranean on April 11 from 6 p.m. to 9 p.m. The classes have a max capacity of 20 people - so if you are interested in any of the topics I'd suggest reserving your spot ASAP. Billy Elliot is playing as part of the Broadway Musical Series starting April 9 thru April 14. We have season tickets for opening night. Hopefully Baby Lucille holds off long enough that I can go... we'll see. Anyways its a great story line - and I think would be a great show to see. If you are in Folsom - or don't mind heading that way for some good deals - the Folsom Just Between Friends is having their Spring / Summer sale next weekend (April 12-14.) You can find deals on clothes for babies and kids and maternity clothes too if you need them. And my last - and FAVORITE mid-April experience - is the Sacramento Kennel Club Dog Show at Cal Expo. It runs the 11th thru the 14th - and is always my favorite place to try and find my dream dog. Again, we're waiting on Baby L any day now -- so this may not work out in my plans but we'll see!